Superbia is one of the Six Black Knights in 11eyes and is the only Black Knight to have not been originally sent by the Holy Office of the Index. She is also one of the only two female members of the Black Knights, alongside Invidia. Superbia's first main appearance is in episode 7, appearing in front of Misuzu and leaves Invidia to fight Kakeru and Takahisa. Before fighting with Misuzu, Superbia easily names the sword Misuzu is holding, and tells her that she knows Misuzu is from the Kusakabe name. She then goes on saying that fighting someone of the Kusakabe name is an irony of fate, and when she takes a stance with her blade, Misuzu instantly recognizes as a Kusakabe stance. Misuzu then reveals in episode 8 that Superbia was originally a woman named Kusakabe Misao and was part of the Kusakabe Clan 70 years ago until exiled when she broke the law of not fusing Eastern and Western magic. In spite of this, Misao is admired greatly by Misuzu because of her legendary power as a female warrior. During episode 9, Takahisa and Yukiko are walking to the Nurse's office to get Saiko so they can get something to eat. However, when they enter the room, they find Saiko tied upside down, dead, with Superbia sitting next to her. While Yukiko fends off Superbia, Takahisa mourns over Saiko, however he then stands up, consumed in fire, and then fires at Superbia just as Yukiko dodges, saying he'd kill her. However, this Superbia is soon proved to be an illusion as the real Superbia appears before Kakeru. When confronting Kakeru and Misuzu, Misuzu calls Superbia "Kusakabe Misao." Superbia then changes from her Black Knight form to her appearance of when she was human. Misuzu then asks Superbia why she became a Black Knight, to which she replies that she did it fight the Destruction, and to protect Avaritia. When Superbia begins to fight Misuzu, she is restrained by the appearance of Kukuri. Misuzu then attempts to put all her energy into one attack but is futile as Superbia easily breaks free and breaks Misuzu's Kashagiri sword in half. Misuzu then throws her Nagamitsu sword at Superbia, which she easily shatters. As Superbia moves to kill Misuzu; however, Kakeru saves her by using his Eye of Aeon, burning Superbia's arm in the process. Superbia's next appearance is in episode 10, fighting Yukiko. Yukiko is easily stabbed through the chest by Superbia, however before she regenerates, Superbia thrusts her arm into Yukiko's stomach, ripping the fragment from her body and killing her. Later, when attacked by Shiori, Superbia accidentally lets go of the fragment, leading to Yuka's freeing of Liselotte from the Crystal. While fighting Liselotte along with Shiori and Avaritia in episode 11, Avaritia shows his true power by transforming into a huge dragon, which Liselotte calls "Georguis—the world's mightiest dragon capable of killing all evil." Superbia then manages to immobilize Liselotte and Avaritia attempts to kill Liselotte with an intense blast. This is shown to have failed when later on in the episode, Superbia reveals to Kakeru and Misuzu that everyone had died while fighting Liselotte. Superbia also reveals that she was in love with Avaritia, as they had met over 50 years ago, and that the world doesn't deserve to exist now that he was gone. During the final battle with Liselotte, Superbia explains that because Shiori was able to travel between time and space, that if Kakeru combined the Eye of Aeon's power along with the fragment left behind from her death, they may be able to force Liselotte into a space-time rift. Misuzu asks Superbia why she didn't want to kill Kakeru anymore and she explains that saving the world was virtually impossible, so they wanted to try and believe in Kakeru. Liselotte then appears, saying that she wants the Eye of Aeon, she then launches a blast at Kakeru that Misuzu intercepts. As Misuzu is blocking the attack, Superbia, now Misao, puts her hand on Misuzu's arm and tells her to put her power behind it. Misuzu and Misao then chant a spell together and launch the attack back at Liselotte, landing a hit. As Misuzu and Misao launch another attack at Liselotte, she dodges it easily saying it was useless. 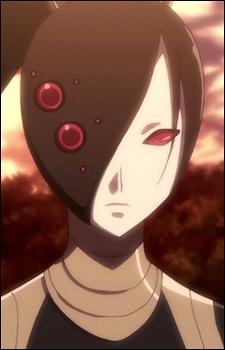 However, Kakeru had seen her dodge in a vision, and appeared behind her. He then holds out Shiori's fragment left behind from her death and activates it, transporting Liselotte into another dimension. As Liselotte attempts to attack Kakeru and escape however, Avaritia appears behind her and grabs her as they are both sucked into the other dimension, trapped forever to the despair of Superbia. Superbia then thanks everyone for their help, saying she didn't know a future like this could have existed, telling Misuzu that she is leaving the Kusakabe name in her care. The Red Night then begins to shatter, which Superbia explains is happening because its creator, Liselotte doesn't exist in the Red Night anymore. Superbia then takes everyone back to the real world, with everyone disappearing in a bright light. Superbia makes a cameo in the 11eyes OVA as one of the 5 Pink Battle-Style Ero Rangers, calling herself Ero-Ranger Lovely Pink. When she strikes a pose with the other Knights however, they all spontaneously explode leaving a crater in the ground.